I don't like novelty singles. That won't come as news to regular readers who know my feelings about songs like "Five In A Row", "Stutter Rap", "Check Out The Chicken" or "Fat". But, it's hard to be as damning when a comedy single is in aid of a worthy cause. This week in 1986, the first Comic Relief charity record stormed straight into the ARIA singles top 5 - the highest debut of the year until it got beaten in the final week. A remake of a song by its original singer together with the cast of a hugely popular TV comedy, the track outperformed the original release and went on to top the chart. The song at the top of the Australian chart this week in 1986 was still "Chain Reaction" by Diana Ross, which spent a second week at number 1. It's odd to be discovering an Elton John single from the '80s I haven't heard before, but this ultra-serious third cut from Ice On Fire flew completely under the radar. Unusual video, too. Like their last ARIA chart flop, this generic-sounding power ballad reached the American top 10, outperforming local hits "Working For The Weekend" and "Turn Me Loose". Yet another single released from stage musical Time, "Because" was a remake of the 1964 single by The Dave Clark Five and was one of two singles on the soundtrack performed by Julian, who sounded more like his father, John, than ever. Despite his previous success in Australia - and the fact that this was a nice enough song - "Because" still performed worse on the chart than the Laurence Olivier monologue, which held onto the number 30 spot this week. It wasn't the only record Julian would struggle with in 1986 - his second album, The Secret Value Of Daydreaming, was a critical and commercial failure later in the year. Like The Saints, who we saw last week, The Triffids were another Australian band whose chart record doesn't reflect how influential and acclaimed they were (or maybe it does, since sometimes the most influential bands aren't commercial successes). Having released their first music independently in the late '70s, it took until this single from second studio album Born Sandy Devotional for the Perth band to crack the top 100 singles chart. While "Wide Open Road" might not have been the biggest hit - and not even the biggest hit by The Triffids - it has become an Australian classic, regularly cited as among this country's best rock songs. Last week, I promised you three ballads, only two of which I like. This is one of the songs I like - the third and biggest single from Heart's career-altering self-titled album. As with previous releases "What About Love" and "Never", "These Dreams" involved outside songwriters, in this case Martin Page and Elton John's writing partner, Bernie Taupin, who'd also co-written "We Built This City". 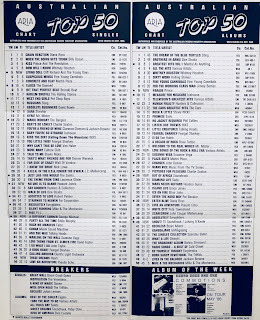 Like the Starship track, "These Dreams" went all the way to number 1 in the US, while in Australia, it had to make do with beating the chart peak of "What About Love" by one spot. Originally offered to Stevie Nicks, "These Dreams" featured lead vocals by Nancy Wilson - the first single released by the band not to have sister Ann on lead. Here's the ballad I'm not a fan of. I wouldn't even say I hate "A Different Corner" - it's just one of those songs that bores me. It's so slow! And it wouldn't be the last time I'd find a George Michael solo single to be dull (or first time, actually, since I'm no big admirer of "Careless Whisper", either). At this point, of course, George was technically still a member of Wham!, with the duo's final releases still to come. But he was clearly keen to get the public used to the idea of seeing him on his own - and the record buyers of the world responded enthusiastically, with "A Different Corner" flying to number 1 in the UK, number 4 in Australia and number 7 in the US. So by process of elimination, this is the other ballad I like. Given a bit of a kick in the pants by Phil Collins and his producer of choice, Hugh Padgham, from the version that appeared on Dream Into Action, the single remix of "No One Is To Blame" had hit written all over it. In Australia and the US, it became Howard's biggest single - with the British performer finally managing an ARIA top 10 single after a couple of near misses. As we'll see in the coming months, unfortunately it was all downhill for him from there. If Howard had been forced to wait for a top 10 hit, it was nothing compared to how long it took Cliff Richard to finally land an Australian number 1 single. And, he could only manage it with the help of four characters from sitcom The Young Ones. The original version of "Living Doll" had been the fifth single for Cliff Richard And The Drifters in 1959. A UK chart-topper, it had only got as far as number 9 locally. 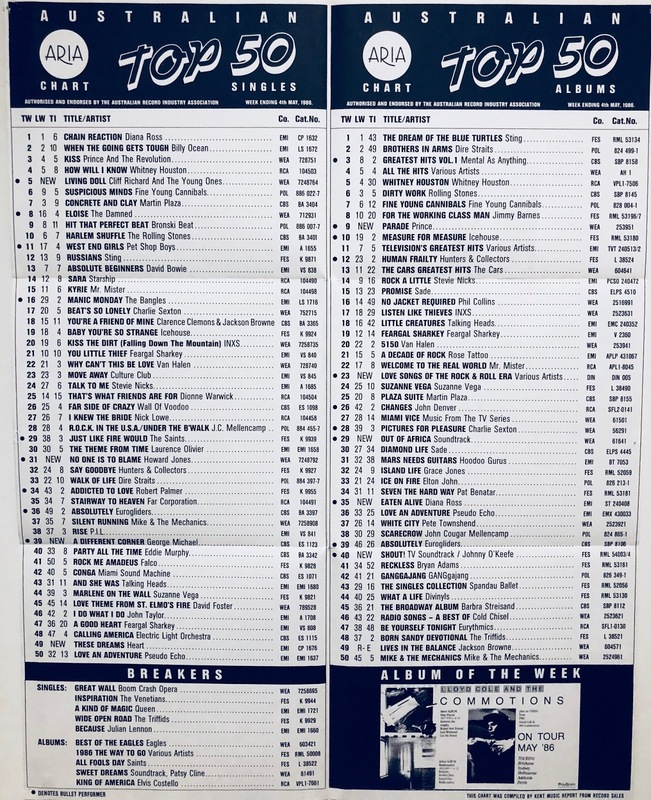 Since then, the Peter Pan of Pop had returned to the Australian top 10 another 25 times, but never progressed higher than number 2, a position he reached with "Please Don't Tease", "When The Girl In Your Arms Is The Girl In Your Heart" and "Wired For Sound". 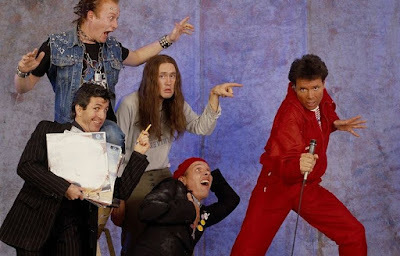 Four years after his previous top 10 hit, "Daddy's Home" (number 8 in 1982), Cliff shot into the chart at number 5 with a new version of "Living Doll", with his straight performance embellished by comedic dialogue and, er, vocals by Adrian Edmondson (Vyvyan), Rik Mayall (Rick), Nigel Planner (Neil) and Christopher Ryan (Mike). Also on the track was Hank Marvin, a member of Cliff's former band The Shadows - the two recording together for the first time in over a decade. The collaboration was the first single released in support of Comic Relief, a new charitable organisation set up by screenwriter Richard Curtis and comedian Lenny Henry initially to raise funds for famine relief in Ethiopia. "Living Doll" would be followed by 1987's "Rockin' Around The Christmas Tree" by Mel (Smith) and Kim (Wilde), and a string of singles into the mid-'90s that followed the same format of teaming a musical act with a comic act. Since then, the release type and pattern has changed a bit, but the biennial Comic Relief drive remains. Next week: a singer who dominated the charts in 1985 was back with a new song and a new look. Plus, the debut of one of my favourite Australian bands of all time. I must admit George's Different Corner was probably one of the most best & emotional masterpieces he wrote throughout his career. That's one beautiful melody. It really does put one to sleep & sings about his hurt, pain & desire to move on. In saying that it wasn't one of his upbeat, energetic songs but was a great song. I didn't know 'Cry To Heaven' either, which seems odd for an Elton single from this period. While I wouldn't say I 'like' it, it's definitely more interesting than 99% of his songs I know, and the video is interesting, too. The synth intro to the Loverboy song sounds like something else, but I can't put my finger on it. Maybe Time Bandits' 'Endless Road'. The Julian Lennon song does sound a lot like John. 'These Dreams' seems like it was a bigger hit than #27. No doubt it would have been if airplay was factored into our chart. I couldn't hum the tune (is there one?) of 'A Different Corner' if my life depended on it; it's hard to believe it peaked at #4 here. I don't recall hearing it even once in the 80's. Never cared for 'Living Doll', though the "fy my soul?" bit is mildly amusing.